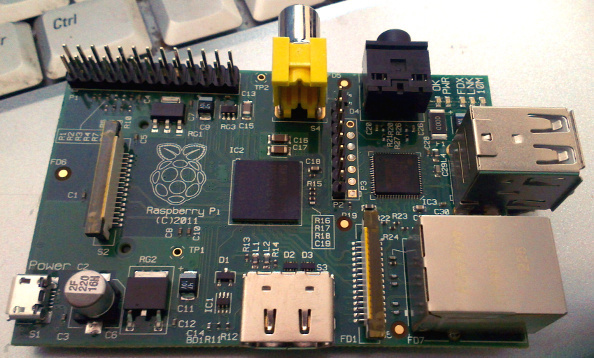 The Royal Mail kindly delivered my new toy this morning – a shiny new Raspberry Pi. I’ve been wanting to get my hands on one of these for quite a while, but what with work and other commitments I’ve not actually gotten around to ordering one – until now. Considering the lead times on the Pi have been long to say the least, I was very impressed to receive mine within three days. I knew they were getting out much more quickly than they did to begin with (demand at the start far exceeded expectations) but still, I didn’t expect to get it in less than a week or two. Ordered from Farnell on Tuesday, shipped on Wednesday, and at my door Friday morning. Sweet! I love working with these embedded computers (in a previous job, I was the operating system guy on a team that designed a high-def video processing engine based on an Ambarella SoC, which is when I got hooked) so it’s actually strange that I’ve not gotten a Pi before now. I’m planning to make up for that with some heavy-duty hacking over the coming weeks. In terms of plans, I’ve got a few. I’d really like to get Android running on it, and maybe use it as an Android-based media and entertainment box. There’s already an effort going on to port ICS to the Pi (the current major issue seems to be lack of GPU and AudioFlinger support) so I’ll take a look into that. In the meantime, there are already Gingerbread ports available. After a few months in Subversion, with a few folks playing with the code and seeing what use they can make of it, the first file release of Deelang is now available from the project’s downloads page. This release is still a very early public release (as denoted by the 0.18 version number) but is already mostly functional (with the notable exception of first-class regular expressions, which may never make it in anyway) and ready for testing. Like most of our Android stuff, Deelang started life as internal code for a (closed source) third-party app, that ended up being deemed “possibly generally-useful enough” for open-source. So, at the moment, it mostly does the things we needed it to do when it was written. And, as with ORMDroid, the intention here isn’t to just dump the code into Google Code and forget about it – I intent to keep developing these things. What I really need is for folks to pick up the code, start using it, and either come back to me and tell me what cool new things they want to see it do, or (even better!) send over a patch with the aforementioned cool new things. Deelang is a lightweight, embeddable, dynamically-typed scripting language for Java that is intended for use in user-scriptable applications in limited resource environments, and especially for Android devices. caption = "I just took this picture!" album = "Random pics I took"
(Obviously, assuming you provide the appropriate Camera and Facebook implementations). These scripts can then be compiled and run on the fly, or compiled and cached for later, perhaps to run in response to some broadcast intent or whatever.